Mitsubishi, the Japanese automaker has left all in awe with its big and bold step of announcing the revelation of its new green SUVs at the upcoming Tokyo Motor Show. Yes! SUV’s’! Though the company didn’t make any appearance at the recent Frankfurt Motor Show, Mitsubishi is to reveal a new series of three green and hybrid SUV concepts at the much awaited Tokyo Motor Show. The brand still owns an amazing line of SUVs with models like the 2014 Outlander and Mirage in its bag, yet hasn’t been much of a newsmaker recently. However, the revelation of the trio concept of the green SUV’s in the Tokyo Motor Show, which has already made much news, has surely created a great deal of possibility to spark things up for the automaker. First up in the new series is the Mitsubishi Concept AR or “Active Runabout”. The SUV concept suggests a future generation vehicle that is compact yet doesn’t limit its usability to one purpose. The multipurpose vehicle is a potent preview of an all new Grandis. The Mitsubishi AR is to be powered by a turbocharged small-capacity direct injection engine. Next is the Mitsubishi Concept XR-PHEV or the Cross (X) over runner which is again a next generation compact utility vehicle and will be powered by a “lightweight and super efficient” plug-in hybrid powertrain. The brand claims that this cross runner will present the driver with “agile driving dynamics and sport-coupe like styling” and might be a preview to the second generation ASX crossover that is expected soon. And finally, the Mitsubishi Concept GC-PHEV or the “Grand Cruiser” is a next generation SUV which is big or rather grand, as the name suggests. This SUV concept sports a plug-in hybrid electric system. Also, the Mitsubishi GC-PHEV concept will be a foretaste to the all new Mitsubishi Pajero that is all set to release next year which would be almost 15 years after the current Pajero debuted in 1999. There hasn’t been any official or complete disclosure of the three vehicles but the teaser images that were released reveal a new design approach of the brand. 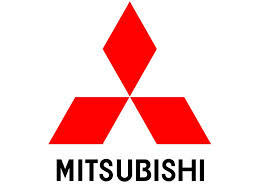 The new SUV concepts from Mitsubishi boast bold emphatic grilles and sweeping lines. Also, the new designs are to feature Mitsubishi’s newest safety features and driver support technologies that operate on mobile network connectivity. Mitsubishi adds that the new trio series concept emphasizes on the brands pursuit of “environmental responsibility, driving pleasure, off road performance and safety” for its coming generation of passenger vehicles. Mitsubishi has come up with an impressive series of concepts for its new hybrid and green SUVs. Be it the full sized Grand Cruiser with all terrain driving capabilities or the Crossover Runner with amazing fuel efficiency and dexterous driving skills or the Active Runabout concept which combines the practicality of an SUV with the interior space and mobility of an MPV, the brand has left no stones unturned to offer a line of SUVs to please all kinds of car lovers and can prove to be a total game changer in the upcoming Tokyo Motor Show. Heavily anticipated new Maserati Levante is going to be a “Latin blend” of fashion, a blend of what else but the amazing BMW X6 and the luxurious Porsche Cayenne. Albeit originally planned to built in a Chrysler US factory in Detroit, the muscularly styled SUV is now expected to be produced in Italy due to the strong and growing demand for Jeep products and hence a need for a stronger factory to support its production. Along with what is said about the new Maserati Levante having mixed influences from the Porsche Cayenne and BMW X6, the 2011 Maserati Kubang concept could also provide a clue for the new SUV’s visual character. However, this is just a clue not the actual styling! The key to what the new Maserati actually is road-based dynamics, deft athletic styling, room for five and a plush cabin. What powers the Maserati’s luxury sports SUV is the company’s new twin turbocharged 3.0 liter petrol V6 engine generating 410 brake horsepower and a twin turbocharged 3.8 liter V8 producing a massive 530 brake horsepower. With twin turbos, direct injection, variable valve timing and an intercooler for each turbo, Levante’s would be a fully modern mill. A 271 bhp 3.0 liter V6 turbodiesel will be the key powerplant for Europe. All engine options will be linked to an eight speed automatic transmission making the on road dynamics of the SUV a delight to experience. Along with prancing horsepower, amazing transmission, a version of the ‘Q4’ all wheel drive system is adapted in the new Levante from its application in the new Ghilbi and Quattroporte models from the firm. This all wheel drive system which already makes the Ghilbi a horse with some real giddy-up, will be modified to be used in the Maserati’s sports ute for its dual purpose role for the all new Levante is expected to follow the footsteps of sister brand Jeep’s on its expertise in rough terrain capabilities. Simply means that the levanter will be equally good an off-roader as it’s going to be an amazing on-road luxury ute. While the structure for Levante will draw on Quattroporte and Ghilbi, its electronics will come from Chrysler and Jeep. Since the Levante gets part of its powertrain and outfit from Ghilbi and Quattroporte, it won’t be surprising if the luxurious yet athletic SUV contains a high level of weight-saving aluminum in its body and suspension. Maserati boss Herald Wester says the Levante is likely to be Italian built although not at the new Grugliasco plant which is home to the Ghilbi and Quattroporte since the beast is way too big for the body-framing equipment and paint plant to handle. 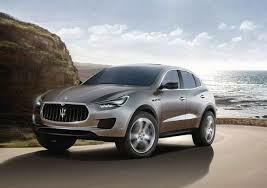 The very fact that Maserati’s new SUV is somewhat a blend of Cayenne and BMW X6 makes it a worthy opponent for the two. X5 is also a sports ute that stands against the Levante. With its defined looks that come from the competitors and its sashaying drive that comes with the tag “Maserati”, this SUV is one to look forward to! A Powerful Set of Insides: The new Audi is fitted a 2.5I TFSI engine that has been chosen as the “engine of the year” three times in its class and creates a maximum of 310 horsepower (a bit lower than what was promised with the original concept car). You can also find this powerplant in the Audi RS 3 Sportback and the Audi TT RS. It’s paired with a seven-speed S tronic dual clutch transmission, a Start/Stop system, and comes with a choices of three driving modes: dynamic, auto, and comfort. Race-Ready Revs: Due to its powerful engine, the Audi RS Q3 can reach 0-62mph in a mere 5.5 seconds and has a top speed around 155 mph. It consumes an average of 8.8l/100km on the European cycle. It also features stability control tuning, a different suspension, and massive 14.3-inch perforated front disc brakes with eight-piston calipers. Several New Sporty Touches: The wheels of the RS model have been fitted with ventilated perforated brake discs, while the RS sports chassis has been lowered by about an inch. The vehicle is also outfitted with a black honeycomb front grille, roof rails, large dual elliptical tailpipes, unique front and rear bumpers, and an aluminum footrest and pedals. Drivers can take full control of their new Audi RS Q3 SUV by bringing up information about the vehicle on their dashboard computer menu, such as oil temperature and the boost pressure. Also available in terms of equipment is the Audi Parking System Plus, xenon headlights, LED taillights, and the brand’s ten-speaker 180W audio system. As far as price is concerned, the vehicle is expected to be sold for about 55,000 euros (around $73,500). The Audi Q3 isn’t currently available in the U.S., however, so it’s unlikely that the RS Q3 will make its way to the States for the 2013 model year either. Of course, things could change for the 2014 model year, and we certainly hope for the best, as both of the stylish rides are quite impressive in terms of look and feel. Don’t forget to check back for more information about the new vehicle surrounding the Geneva Motor Show, taking place on March 7-17th at the Geneva Palexpo.For more of the latest automobile news, stay tuned here with reviewitonline.net. Reviewitonline.net is a complete resource for latest information on new car models of all types, classes and sizes. We also have comprehensive, unbiased reviews of all of the newest models. Aging celebrities know that a few exterior edits can go a long way, and luxury auto brands such as Mercedes-Benz understand that a great nip-and-tuck for an automobile model can do the same thing. For the first time this year, the Mercedes-Benz GLK-Class gets slight, yet very effective, edits. The new Mercedes-Benz GLK-Class sees the most changes inside its cabin, where much more luxurious materials are used than in the previous model. Featured are Mercedes-Benz traditional large chrome vents, better quality materials, a large amount of wood trim, and a general overall improved ambiance. The front seats of the new GLK-Class are quite roomy, but rear seat legroom is rather pinched. For the best use of space, it’s advisable to use the rear seat for holding children, or simply fold it down to hold shopping items or groceries. When it’s folded, cargo space increase from 35 feet to an impressive 66 cubic feet. On its exterior, the new SUV looks quite similar to the way it first appeared in 2010, with styling cues from the larger Mercedes-Benz G-Class and Mercedes-Benz GL-Class. It does, however, look rather softened and simplified overall, in a very positive way. New LED and fiber optic taillights are featured, but the vehicle’s sharp lines are still left over from the original model. Rather wagon-like in appearance and nearly a foot shorter than the larger Mercedes-Benz M-Class sedan, this year’s GLK-Class receives an improved, well-damped steering wheel and an improved suspension, which gives it the ability to make sharp turns effortlessly. This is due, in part, to the lack of roominess you’ll find in its backseat. Underneath the vehicle’s hood, you’ll find a rather powerful new 3.5-liter DOHC V6 that gets a boost of 34 horsepower versus last year’s model (putting it up to 302 horsepower), despite the fact that its engine is the same size as the one before. Paired with this engine is a seven-speed automatic transmission as standard, with manual paddle-shifters mounted on the steering wheel. This combination helps the vehicle achieve 60 mph in 6.4 seconds, which is quite impressive for an SUV. In short, though it’s certainly powerful, the SUV is not all brawn. It’s truly fun to drive, and it’s certainly nice to sit in for a while. Fuel economy ratings come in at 19 mpg city/24 mpg highway and is paired with such features as an engine stop/start system to keep fuel use frugal. Later in the 2013 model year, the Mercedes-Benz GLK250 BlueTec will be the first compact luxury crossover SUV featuring a diesel engine, and it should have the best fuel economy ratings in its segment. The 2013 Mercedes-Benz GLK-Class will be available in two main trims (not counting the diesel variant): the base GLK350 trim with RWD and standard features, starting at $37,090, and the GLK350 4Matic model, featuring all-wheel drive and starting at $39,090. Though the SUV boasts several new standard features, its optional features are much more impressive. These, however, can be quite pricey when you add them all up. Overall, this year’s GLK-Class is more luxurious and powerful than ever before. For more information about the 2013 Mercedes-Benz GLK-Class, or any other new SUV models, be sure to check out our informative reviews, and don’t forget to check back often for more updates! Are you hesitant about purchasing a new SUV? After all, sometimes the full-sized vehicles get a bad rap for their negative impact on the environment. However, as auto companies continue to find fuel-efficient ways to power the large vehicles, it’s becoming quite apparent just how appealing they can be. The crossover SUV, in particular, has really been dominating the auto market recently. A Roomy Interior: SUVs are known for being spacious enough to handle all of your family members and their corresponding cargo. Though SUVs don’t have the same cargo carrying capacity of a truck, they are quite capable of transporting large furniture and huge groups of people. Their interiors are also quite versatile. With the seats folded down or up, there are many options available for storage. A few SUVs even offer power tailgates like trucks do, so drivers have easy access for space. In short, they offer many of the same advantages of a van without being as bulky. They’re also much more appealing to look at. Some SUVs hold up to eight or more passengers, and if you have a large family this is extremely important. Some of the most roomy SUVs on the market include the Chevy Suburban, the Ford Expedition, the Lincoln Navigator, and the Cadillac Escalade. Powerful Insides: SUVs are powerful because they typically boast a six- or eight-cylinder engine. And, though a standard SUV may only produce around 200 horsepower, ultra-powerful models like the BMW X6 M achieve well over 500 horsepower. As mentioned, most SUVs, like trucks, are capable of towing up to a few tons, which means that family boating activities are always an option. Because many SUVs are also equipped with 4WD, off-road activities can also be a viable option. 4WD capability also means that an SUV will also be able to safely navigate in all types of weather, be it a snow storm, a rainy afternoon, or a beautiful summer day. Precise Handling: Though each SUV comes with its own degree of handling, most SUVs have quite excellent handling capabilities. Of course, 4WD is a big part of this, as it allows for use in remote or hard-to-reach areas. Other SUVs may be equipped with all-wheel drive, which is also helpful in all-weather situations. Either way, have a drivetrain that handles well on all types of terrain and road surfaces is essential for the adventurous types. Excellent handling also means that many SUVs can respond quite quickly in situations where reactions are key. To be fair, there are also downsides to driving an SUV. As previously mentioned, fuel ecomony can be an issue, but there are safety factors to consider as well. Though vehicles continue to get safer each year, SUVs can have more potential to roll over than other types of vehicles. With the IIHS cracking down on rollover safety ratings, however, this is becoming less of a concern. Looking for more information about new SUVs? Look no further than reviewitonline.net. We’re here to provide the latest updates and the most comprehensive reviews around! Subscribe to our news section’s RSS feed for the latest news. 2013 is quickly approaching, and many motorists are considering replacing their aging, outdated vehicles with shiny new ones for the new year. Car buying isn’t what it used to be, however, with new nameplates and never-before seen models hitting dealerships at every turn. From well-appointed luxury vehicles to cost-efficient reliable ones, drivers have never been faced with as many great choices as they are right now. So, what’s an overwhelmed buyer to do? 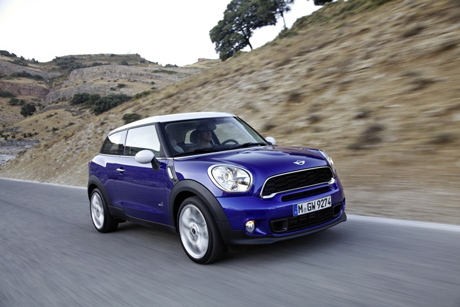 Simply consult our handy list of the hottest upcoming 2013 SUV models, of course! This year’s crop of SUVs is mainly comprised of crossover SUV models, which have all but conquered the SUV market and supplanted the traditional truck-based SUVs of the ‘90s and early 2000s due to their increased fuel economy numbers and more car-like handling. Many automakers now include compact crossover SUVs in their lineups, though traditional crossovers are still quite popular. Five of the Hottest SUVs for 2013: (In no particular order). 1. 2013 Subaru XV Crosstrek: A sort of hybrid between a compact wagon and a crossover SUV, this stylish vehicle is a more rugged and higher-riding version of the popular Subaru Impreza on which it’s based. As with all Subaru models, this stylish crossover comes standard with all-wheel drive, though this particular model is perhaps even more impressive when mated with a gearless CVT automatic transmission. (There’s also a five-speed manual trans mission available. Stand-out features include a voice and touchscreen controlled navigation with real-time traffic alerts, an HD radio, and a rear-view camera. 2. Mazda CX-5: (as seen in the included photo) This all-new crossover SUV has been touted as one of the most fuel-efficient around due to its 2.0-liter Mazda SKYACTIV four-cylinder engine that achieves a respectable 26 mpg city/ 33 mpg highway and features all-wheel drive as optional. It’s sporty, and uniquely stylish, as well! 3. Infiniti JX: The all-new Infiniti JX began reeling in a ton of attention much before it premiered in production form, and it certainly doesn’t disappoint now that it’s here! A luxury SUV with seating for seven, advanced safety features, a roomy and elegant interior, and a stylish exterior, the JX is all that a family desires, and more. Impressive safety features include a new Backup Collision Intervention system, while a Drive Mode Select feature keeps the journey smooth in all weather conditions. 4. Buick Encore: A boldly-stylish new subcompact crossover with a ton of flair, this sporty little SUV boasts a super-quiet interior and smooth ride due to its active noise cancellation system. It looks quite a bit like the Chevy Sonic, to which it’s mechanically related. 5. BMW X1: Both strong and sleek-looking, this new subcompact crossover SUV is also very agile and speedy. It’s a bit smaller than the BMW X3, and is therefore also more cost-efficient, yet it still has features to impress even the choosiest drivers and passengers, including a start-stop function for heightened fuel economy and an advanced xDrive all-wheel drive system (standard with the BMW 35i engine and optional with the four-cylinder 28i engine) for maximum handling on wet or dry roadways. Remember, reader, these are excellent vehicles to consider for a 2013 (or late 2012) purchase or lease! For more great advice, be sure to stay tuned here with suv.reviewitonline.net. We always have the latest news, and we can’t wait to share it with you! General Motors might be trying its best to keep its new 2014 models under-wraps, but in the age of the internet, nothing stays secret for long. And, with the interesting new line-up GM is working on perfecting, it should come as no surprise that keen eyes have been on the watch to glean all of the juicy details. 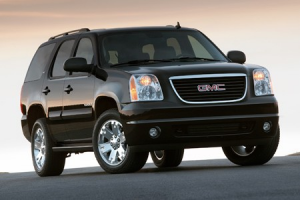 For the 2014 model year, GM will be replacing the ever-popular Cadillac Escalade, the Chevrolet Tahoe, and the GMC Yukon full-size SUVs (along with several other SUVs). The new replacements for these vehicles were recently seen making a sneaky exit from the auto giant’s testing grounds in Milford, Michigan. Reportedly, GM will spend around $331 million to renovate its assembly plant in Arlington, TX to accommodate for the new vehicles, and this expansion could also add production of the Chevrolet Avalanche and Cadillac Escalade EXT if they’re brought back for a third generation. The plant will hire around 110 new employees to take on the work that will come along with these new developments. Originally, General Motors planned to release replacements for these full-size family vehicles for the 2013 model year, but production was pushed off due to legal issues, though the company has been known to surpass deadlines before (such as early production of the GMT900 family of SUVs in 2006- just in time to avoid the 2008 financial crisis and increasing fuel costs). According to spies in the auto industry, the new SUV test vehicles boast padded, black cladding on their grilles which look quite a bit like the grille of the current Ford Expedition. They also seem to keep their rear axle design and should prove formidable contenders as far as tow rating is concerned, which makes sense since they’re based on GM’s next generation of full-size pickups. We’ve also received word that the new, large vehicles could eventually receive a brand-new line-up of automatic V8 engines and could also get 8-speed automatic transmissions, though six-speed transmissions might be the only ones available when they are originally launched. The 2014 GM SUV models seem to be standard wheelbase models and appear to retain their boxy looks, though several models seem to have received several stylish, streamlined elements to increase fuel economy ratings, including a rather recessed hatchback and a deep chin spoiler. From the small holes located in the bumper covers, we believe that there will also be some kind of radar parking sensors on the vehicles. The stylish new SUVs are set to make their debuts at either the 2013 Chicago Auto Show in February or the North American International Auto Show in Detroit in January 2013, and production will begin at the Arlington plant in October 2013. Want more updates on the latest auto happenings? Stay tuned here with reviewitonline.net (RIO), and be sure to scan the wealth of information available in our new car reviews. From luxury coupes to fuel-efficient family-haulers, we’re your comprehensive source for all things auto.